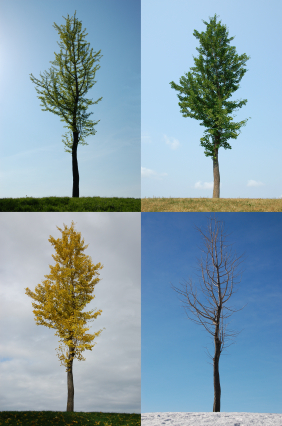 Which season do you like the best – spring, summer, fall or winter? Most of us have a favorite season. But what causes seasons? Seasons are caused by the Earth’s tilt in relation to the Sun. 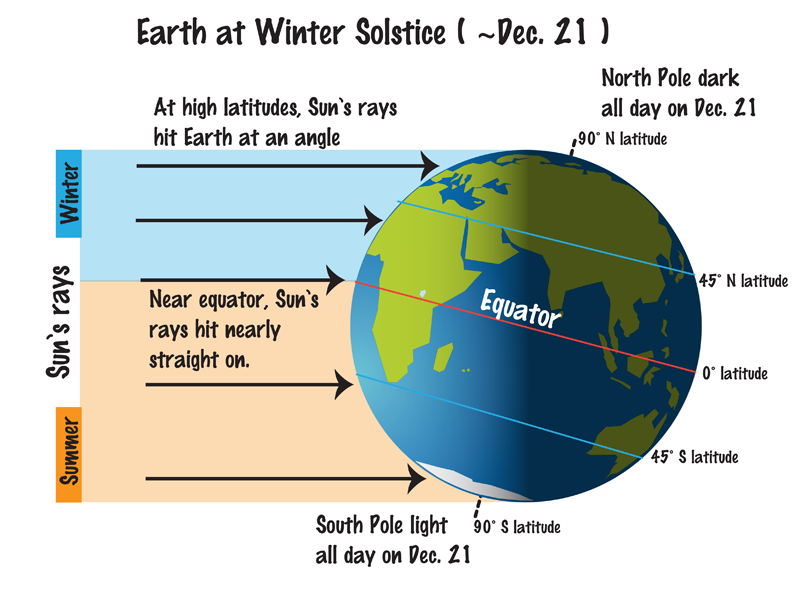 When winter arrives in the North, that part of the Earth is tilted slightly away from the Sun, while the Southern hemisphere is tilted towards the Sun. When it’s summer in the North, that part of the Earth is tilted towards the Sun. The seasons in the Northern Hemisphere are opposite those in the Southern Hemisphere. This means that when it’s winter in the United States, it’s summer in Argentina. Imagine going to the beach for Christmas! Winter officially begins in the North on December 21 or 22. This is the shortest day of the year. Summer begins on June 21 or 22, the longest day of the year. 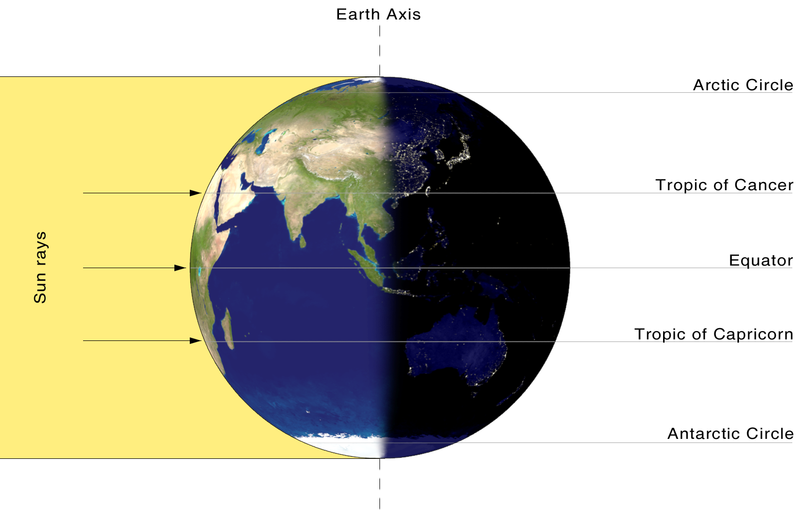 Spring and fall equinoxes have days and night that are equal in length. Spring equinox occurs on March 21 or 22. Fall equinox occurs on September 21 or 22. When the seasons change, temperatures change and the length of day changes too. Winter brings short days and long dark nights. Temperatures are cold. Summer brings long, warm, sunny days and short nights. Areas near the equator don’t experience much seasonal change. It’s warm and sunny year-round here. Areas further north experience more drastic changes. In Scandinavia and Alaska, the sun might not shine at all during the winter. During the summer, the sun might not set at night. Question: Are seasonal changes the same as climate change? Answer: Seasonal changes are not the same as climate change. Seasonal changes are predictable changes – like falling autumn leaves – that happen every year. However, climate change can alter seasonal changes, causing shorter winters or drier, hotter summers. Enjoyed the Easy Earth Science for Kids all about the Four Seasons info? Take the FREE & fun all about the Four Seasons quiz and download FREE all about the Four Seasons worksheet for kids. For lengthy info click here. Declan, Tobin. " Fun Four Seasons Facts for Kids ." Easy Science for Kids, Apr 2019. Web. 24 Apr 2019. < https://easyscienceforkids.com/all-about-the-four-seasons/ >.